March on Washington 50th anniversary dispatches. Attendees of the 1963 March on Washington link arms with college students and other marchers. The crowd marshals at the March on Washington in 1963 wore hats that made them look like bakers. 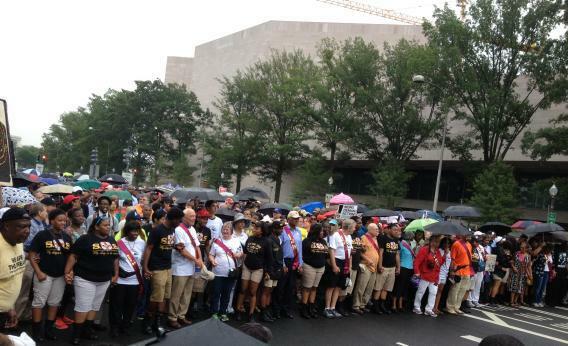 Today, the marshals wear plain black T-shirts as they usher the ‘63 March attendees to the front of the crowd. A crowd marshal was leading an older black man to the front of the crowd marching down New Jersey Avenue. People turned to look and applauded the man, who looked back sheepishly. A teenager turned to his mom and said, “1963 … I wasn’t even born for 31 more years!” They kept marching. Much like the original March on Washington, today’s march stood for a panoply of causes: the justice system, voting rights, jobs, and welfare for the poor. As thousands marched past the Bureau of Prisons downtown, some held up signs calling for justice for Trayvon Martin’s death and called the prison system “the new Jim Crow.” One sign took issue with the farm bill, reading, “Keep SNAP Funded.” Another took a statistical tact, noting that black people make up 12 percent of the U.S. population but 44 percent of the country’s prison population. Check back in this post for updates on this afternoon’s speeches from the Lincoln Memorial. In the meantime, make sure to watch King’s original speech.